Figure 140: A rare archival clip of the first dogs to work in a call center (1950). Sometimes customers can be im-paws-sible to deal with, especially when they’re hounding your call center and being ruff with your agents. No need to howl, as we have the paw-fect animal to take the job! Coming in at #260 is the classic doggo. They make a constant appearance on our reports because of their easy-going nature. 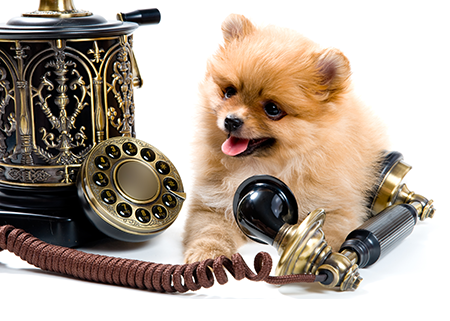 Did you know dogs were some of the first call center agents? Known for their superior customer service skills, they make the best agents for your support and service lines. What would make a better customer service representative than an animal that naturally likes to sniff butts? And yes, puppy eyes can be heard over the phone. Even better is that they only need to be paid in belly rubs and pup-kin spice lattes. Figure 260: Cat got your tongue? Put them to work as your chat agents. 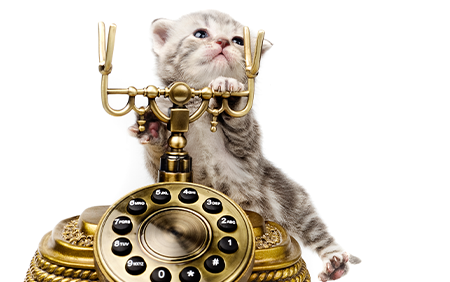 Climbing in at #140, cats are a relatively new introduction to the call center space. It turns out that all their time on the internet, sitting on your keyboards and laptops, and cat-chatting on mIRC have taught them the necessary skills to make it in the digital age of the call center. Cats are known for their speed and agility, but did you know that applies to their typing prowess as well? The average cat types at over 188 words per minute, which translates to over 19 scratches on a scratching post. This makes them the purr-fect candidate for your chat agents and their quick, laser-focused responses will leave your customers paw-leased. Put the “awww” in omni-channel with more purr-sonality than a chat-bot or event cat-bot could provide. They’re a bit more expensive to employ than dogs, as their millennial spirit demands that they have avo-cat-o toast on the regular. Figure 10: A cockatoo call center manager seen with some chat agents. Coming in at #10 are birds, a versatile part of a call center ecosystem that can be found in many different types of roles. For being natural tweeters and speakers of the animal kingdom, they are great at handling social media and manning the phones, but their strengths actually allow them to be great call center managers. Being able to fly above your team to chirp orders has its benefits! Their approach to customer service and management is as soft as a feather, but their dinosaur blood ensures that tasks will get done. Some might say all they do is repeat what you just said, but that’s simply their attention to detail! On the busiest of days, they can be found flapping around and taking calls along with their agents, showing true managerial spirit. In fact, Fonolo was founded by three birds who were tired of the long wait times experienced in their call center. From that frustration came Macaw-Backs, later renamed Call-Backs, the must-have addition to your call center! You’d think they’ll work for crackers, but they more of a “100k signing bonus, stock vesting over 2 years, with refresher grants added each year, and a snack room full of artisan crackers” kind of flock. Good talent doesn’t come cheep cheep! Don’t miss out on the rest of this must-read report on hiring and call center trends! Download the full 102,000 page report for FREE to see all 4119 animals, how they rank, and what they can do for your call center today! Lettuce introduce entry #35 – cabbages! Just like your sales team, cabbages are deeply spiritual, layered individuals that inspire gasses when put under pressure and heat. Green and leafy like the stacks of brilliant cash they bring to the company, cabbages are the perfect brassica to replace your bro, sick, yeah sales team with. Happy day of foolishness brought on by the first of April, everyone!